24 step-by-step origami projects suitable for children or adults alike. Projects are ranked as very easy, easy, and detailed, and the book includes tips for best results. 24 simple, easy-to-follow projects for beginners to the art of origami. The ancient art of origami continues to fascinate young and old alike. More than a method of artistic expression, it provides an opportunity for reflection and relaxation. 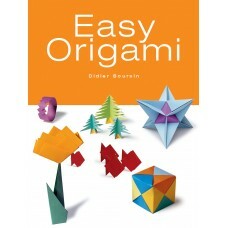 Easy Origami takes beginners step-by-step through the process of creating 24 simple yet interesting projects. Children, teens and adults will construct a hamster, a butterfly, an airplane, a house, a garland, a star cluster and more. The book begins with general tips on getting started and obtaining the best results. Easy-to-follow directions are included for all the basic folds. The projects are then organized by level of capability. Easy Origami is the perfect introduction to this popular craft. Beginners of all ages will have fun folding and unfolding as they discover a magical world of paper creations.